To cleanse & restore your Chakra Energy Centers and your Auric Field. Your Aura is the subtle radiant light body that surrounds your human physical form. It is also referred to as your Auric Field or Human Energy Field. 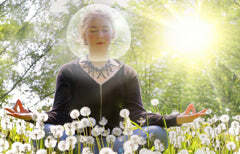 Your Aura can become cloudy and congested with discordant energies and your Chakra Energy Centers can become clogged. This can results in lower energy and vibrational resonance which generally causes you to feel out of sorts with yourself and your life and can lead to serious health issues. Natural sea salts are rich in minerals and charged with electrical and healing properties that you can especially benefit from in a warm bath. A sea salt bath with pure essential oils is an effective way to clear, cleanse and restore your Chakras and Auric Field. You can purchase natural sea salt in your local health-food store in the spice section. For more information about chakra healing and balancing check out my Chakra E-books. "Anyone wanting to open their psychic channels needs to clean and balance their chakras through visualization and meditative means." Add 3-8 drops of pure essential oil or blend to your sea salts and blend the mixture together thoroughly. The sea salts act as the carrier for dispersing your pure essential oils into your bath waters. Your bath waters should be a warm, not hot; around 98.6º or body temperature is best for clearing, cleansing and restoring your human energy centers (chakras) and cleansing your Auric Field. Soak for 15 minutes or until your bath water begins to cool. After completing your soak imagine the healing waters carrying any soot or cellular debris that may have been removed from your Auric Field and Chakra Energy Centers as you watch it go down the drain. Conclude your aromatic sea salt bath with a slightly cool shower. This will help recharge your Auric Field and Chakra Energy Centers. Please remember to hydrate sufficiently during and after your bath. Did you like this article? I always love hearing from you. Please leave your questions and comments. Until next time...relax, enjoy your life and stay connected! This really reached out to me…as if my body knew this is what it needs…I plan to indulge in this ritual tonight. Thank you. this is a great idea, will use it today, perfect timing for me.